Cooking Tofu Tips and Advice. Tofu Help for All. If you're a vegetarian who can't cook tofu, you're probably feeling a bit frustrated, so here are a few of my cooking tofu tips and advice. Tofu Overload. Just a few years ago, it seemed tofu was "the protein" for vegans and vegetarians. But as nutrition facts spread, more people learned that tofu definitely wasn't the only way to get animal-free protein. And with so many vegan protein foods, from exotic vegan products featuring seitan and tempeh to whole grains, lentils, nuts, beans and good ol' veggies, tofu is really just a sometimes food, instead of an every meal food. Hi Kathy, My name is Enia and I'm a recent vegan (1 year). I found your blog when I was trying to prepare my first vegan Thanksgiving. I love your recipes but I have a problem. A giant problem for a vegan to have: I can't cook tofu worth a lick. I like it when I eat it in restaurants so I know it's me and not the tofu. It either comes out dry and spongy or falls apart. I don't know what I'm doing wrong: I'm a pretty good cook otherwise. Do you have any tips you can share? Basically, I want to pan fry it or bake it and make it have flavor. I see that you make delicious-looking tofu all the time. So can you help with some very rudimentary directions? I would appreciate it forever. *Quality Matters. There are a lot of various tofu brands out there. And yes, some brands are better than others. There are even a few artisanal tofu brands you can find at farmer's markets and local stores. One example is Hodo Soy in San Fran, CA. My advice is to try at least three different brands and decide which suites you best. Not all tofu is created equal. I have always been impressed with Vermont Soy tofu, but there are many high quality brands on your grocery store shelf. *Silken or Firm? Silken tofu is generally used for recipes other than a straight-up saute. Choose firm or extra firm tofu for a saute or baking recipe. I prefer extra firm since it pretty much guarantees that my tofu won't fall apart. However, if you are seeking a pillowy tofu, firm may be for you. *Low Moisture. Always squeeze as much moisture out of your tofu before placing it on the pan. Use a few paper towels and wrap it tightly - let it sit for a while and soak up the excess moisture. Some chefs even let tofu soak in towels overnights. More moisture out, the more flavor can get in. *High Heat. Make sure your pan and braising/oil liquid is HOT. This is important for that beautiful brown sear color and texture you want on your pan sauteed tofu. *Keep it Moist in the Pan. You can pan-saute tofu in either oil or a combination of liquids - I use and combine everything from fruit juice, vinegar, agave syrup, maple syrup, orange or lemon juice, water, wine, oils, marinades, soy sauce, miso soup, liquid smoke and of course veggie broth. I use a combo of different liquids for each recipe. You can't just wipe a tsp of oil in your pan and expect to get a flavorful saute. 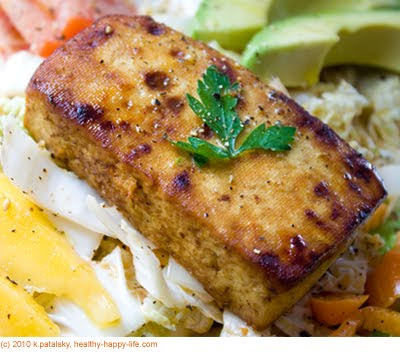 Tofu is not a seasoned food, and thus needs a a lot of flavor added to make it tasty. The good thing is that tofu is like a sponge and will easily soak up all the flavorful liquids and even dried herbs and spices that you add to it. Also read my Braising 101 Post here for tofu braising info. *Spices. I always add flavor in the form of liquids and dry spices/herbs to my tofu. My favorites are garlic powder, cayenne, black pepper, turmeric, paprika, ginger, cinnamon, nutmeg, thyme, onion powder and my favorite for a savory Mexican flavor: cumin powder. I will either add these spices to my marinade, or sprinkle them directly on the tofu before and while sauteing. *Salting. Tofu needs salt. It just does. Even a tiny pinch will do a world of good. I like to add a pinch of coarse sea salt at the end of my saute or bake. You can also add salt in the form of vinegars and soy sauce during the cooking process. Pepper too. A pinch of fresh pepper makes your tofu extra happy. *Tofu Needs You! I never just let my tofu sit on the pan - for too long. I like to get a super high heat and do a tossing style saute until the edges are browned and the center seems fluffy and moist. Also, moving the tofu around creates steam, which further pulls the moisture out. Notes: to create a nice seared color on your tofu, you will want to let it sit in the hot pan for a few seconds, followed by a brisk shake of the pan and flip of the tofu. A larger cut of tofu will need to sit longer to create a sear. Bottom Line: Don't walk away from the tofu, it needs your eyes. *Baking Tofu. 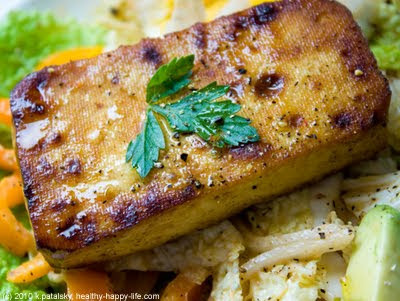 If you are baking tofu, bake covered for a moist spongy texture and uncovered for a dry firm texture. Baked tofu should be marinaded first. But if you bake tofu in a sauce or liquid, you will likely get super mushy tofu- yet still flavorful. Sometimes 'mushy' tofu is yummy, but it's not always what you want. Baking tofu if helpful if you want a no oil added tofu dish. While a high heat saute, does usually require oil. *Freezing Tofu. You may have heard that if you freeze tofu before cooking with it, you will get an extra fluffy, luscious tofu texture. I have personally never tried freezing tofu for texture, but it never hurts to experiment. I have been fine using tofu straight from the container. *Marinate Tofu! If you have time, after you have squeezed your tofu "dry" with a paper towel, set it in a marinade liquid for a few minutes - a few hours or overnight is even better. When I marinate my tofu, I like to use enough liquid to cover my tofu and let it soak for half a day. Flavor galore! *Cube it! When I don't have time to marinade and want my tofu in under 20 minutes, I like to cube it. Then saute. Cubing it makes tofu cook faster and creates more surface area, for those nice brown crispy edges I love so much. *Troubleshooting. If your tofu starts to burn on the pan before it is fully cooked, keep adding in a tiny bit of liquid like water, broth or an acid like vinegar/citrus juice. This will deglaze the pan (get the flavors moving around off the pan) and it will also create steam to keep the cooking going. You don't want your high heat pan to burn up. A burnt pan is a good path to a tofu disaster. Towards the end of the cooking process, make sure there is no liquid in the pan - this will get the edges crispy and brown! But don't overcook and dry out your tofu. Be sure to move the tofu around in the pan a lot (a nice shaking and tossing motion with the pan will work). *Tools: Don't use a fork or tongs with tofu. Use a soft wooden spoon or a high heat spatula or long spoon. You don't want to harm the tofu. Use a wide saute pan. If you must use a soup pot, you will have to use a lower heat to avoid burning the sides of the pan.